Pre-E3 announcements and leaks are everywhere at the moment and the latest leak may have just revealed the next game in the Assassin’s Creed series, Assassin’s Creed Odyssey. French site Jeuxvideo has posted an image of a keyring for a game called Assassin’s Creed Odyssey. The keyring shows the helmet of what appears to be an ancient Greek soldier which would suggest that ancient Greece will be the setting for the follow up to the ancient Egyptian setting in Origins. Certainly, since 2016 we’ve been hearing rumors (via GamingBolt) that the new direction of the Assassin’s Creed franchise would be a trilogy that would take players from ancient Egypt, to ancient Greece and then to ancient Rome. And the rumor that the next game would go to ancient Greece re-emerged earlier this year following a report from Comicbook. This merchandise leak fits in nicely with all of these rumors. This wouldn’t be the first time a leak of this sort has happened to the Assassin’s Creed series before E3. 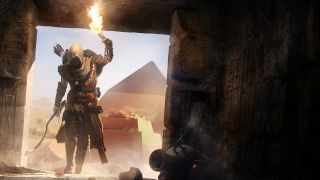 Only last year, Origins and its Egyptian setting were revealed following a promotional T-shirt leak. Of course, without any official comment from Ubisoft we don’t know whether this keyring (or any of these rumors for that matter) is the real deal or not. It’s likely that we’ll find out one way or the other during Ubisoft’s conference at E3 in a couple of week’s time.